I had a C-Section about 8 years ago and now after 2 more children (v-backs) I am getting back to the gym. I am a bit out of shape but not too bad. I recently started a mat pilates class and now my lower abs are killing me. It feels like my C-Section is reopening and I cannot do the exercises. I am wondering if this has anything to do with my old C-Section and the muscles being so completely out of shape, or is it something else. Please help - I love the class and it feels so good to be back at the gym! Hi Brooks and thank you for your question. I know how you feel having a 3 month old myself, I feel very weak in my abdominal muscles and had her vaginally. I can imagine how you must feel so much worse after a C-Section. Just remember, your muscles have been compromised and you'll need to progress and make modifications to the original Pilates exercises until you are able to do the full classic sequence. In particular, the tabletop position with your legs floating in the air may be straining your back and lower abdomen. Tuck your knees in deeper to your chest or support your lower back with your hands wedged under your hips to take some pressure off. Talk to the class instructor and ask her if she can give you some modifications to the exercises as you go, if not, then you need to find a lower level (beginner class). has modifications and progressions from beginner to advanced levels for you to consider. Also, my Pilates DVD has 2 workouts for modifications and a beginner level that you can progress into. These may be good resources for you to practice and integrate into the mat classes you are taking. Specifically, the Pelvic Lift or Bridging is a good exercise for you to start with. Take it slowly and be consistent and you will get results with Pilates. Thanks Jennifer! I will try your recommneded poses and go slow. Hopefully that is all it is! I am a woman aged 62 and mother of two - one 22, and one 18 and had two C-sections. Every time I want to start exercising I say to myself, there is no point because of the c-sections, which will not help as all the muscles are cut. What would you advise, please? In fact I have a "Pilates book" bought about 5 years ago. Having read the articles and watched a couple of videos, I am somewhat motivated. I would appreciate your advice regarding the C-section problem. Hello Susan and thank you for your question. Exercising after a C-Section, or several can be confusing and daunting. Even though the muscle tissue was cut it does heal and build back together through scar tissue. It's very important to exercise your abdominal muscles because they help to protect and support your spine. Obviously after many years your tissue and scars have healed and you can safely and effectively begin doing some abdominal exercise. I feel like you are definitely on the right track and should feel motivated to do Pilates exercises. They are so effective at not only flattening and strengthening your belly muscles after a c-section, but also by working the deeper transverse abdominal muscles that help support your spine. I would suggest beginning your Pilates exercise with some of the fundamental or beginner level progressions. Pilates Ebook – Relief for Back and Joint Pain is a safe and effective way to get started doing Pilates as it shows you 3 levels of progression of the classic mat exercises. 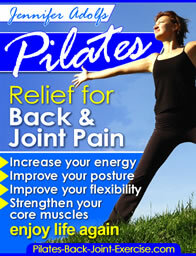 If you prefer following a DVD then check out my Pilates for Healthy Back and Joints DVD here. Susan, I appreciate your comments. It's going to take a while to stimulate and even find your deep pelvic floor and abdominal muscles after years of disuse. When you are doing your Pilates or mat exercises concentrate on flattening and feeling the deeper internal muscles. Imagine bringing your coccyx and pubic bones closer together from deep inside. The pelvic floor muscles act like a hammock to lift and support our internal organs. Feel the muscles working to lift and support very much like a kegel. Best to you and all ladies who have had a C-Section. i have the same problem as susan. i am 51 with a 25 yr old son via c-section. i just started pilates 2 weeks ago for the first time and my scar is killing me (well not literally). i really have no stomach muscles and am not an exerciser but decided it is never too late to begin...so do you think this is seperating my scar or what is the problem? ?